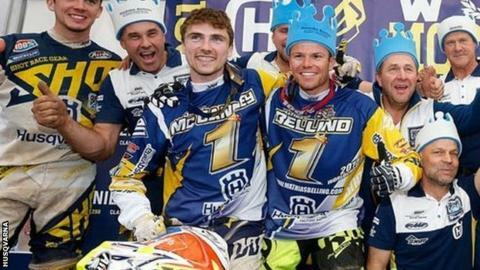 The Isle of Man's Jamie McCanney has followed in his brother Danny's footsteps by winning the Enduro Junior World Championship. McCanney secured the title with a fourth-place finish in the final round in Requista, France on Saturday. The 21-year-old Husqvarna rider tweeted: "2015 EJ World Champion. Words can't describe how I feel right now." His brother Danny, who now rides in the Senior Class, also won the title aged 21 in 2013. Jamie said: "It's a great feeling to have won the Enduro Junior title. "I knew I didn't have to win either day in France but I wanted to end the season with the best results I could. "I basically did what I needed to do". McCanney finished his campaign with 233 points, 20 ahead of nearest rival Giacomo Redondi.